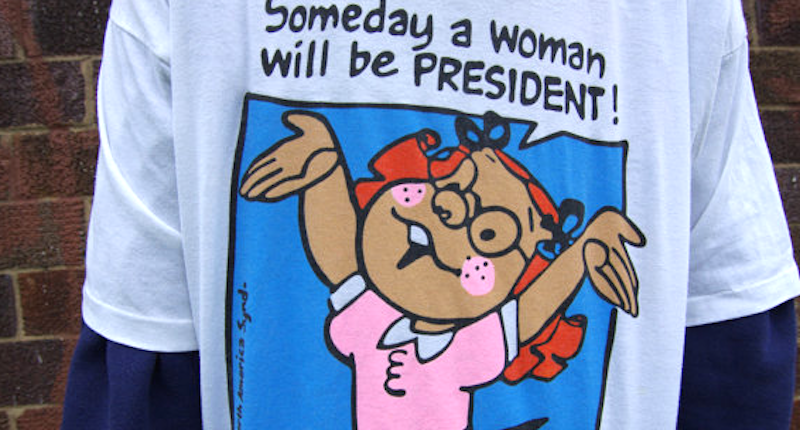 Twenty years and a political generation ago, a psychologist who studied children’s perceptions of women leaders marketed a t-shirt through her local Walmart with an empowering message: a panel from Dennis the Menace with the character Margaret proclaiming that “Someday a woman will be president!” But the statement was too outrageous for some customers at the time, and the store temporarily pulled the shirt in response to complaints. Two decades later that psychologist, 91-year-old Ann Moliver Ruben, is looking back on the saga in wonder at how far the zeitgeist has come, regardless of one’s personal political leanings. When she licensed the Dennis the Menace panel from King Features Syndicate, Ruben had recently completed a survey of 1500 Miami elementary students which found that nearly half “believed that only men could be president.” Concerned that many girls were internalizing the message that they could not be leaders, she designed the t-shirt and sold a few hundred to one Walmart store in Miramar, Florida. Before long, the store’s buyer pulled the shirt from the sales floor after at least one customer complaint. Ruben says she was told that “the message went against [Walmart’s] philosophy of family values,” while the store’s public statements at the time simply stated that it was “offensive to some people” and violated the chain’s corporate policy of political neutrality. The story soon spread nationwide, resulting in many more customer complaints in favor of the shirt and its message, as well as a protest by members of the American Association of University Women outside the Miramar store. Wow, it still pains us that we made this mistake 20 years ago. We’re proud of the fact that our country — and our company — has made so much progress in advancing women in the workplace, and in society. Today, Walmart itself employs ten women in top leadership positions, including the president and CEO of the Sam’s Club chain. In the world of politics, women from both sides of the aisle have been well within reach of the presidency, and Ruben is overjoyed that what was just a theoretical empowerment message in 1995 may soon come true. Regardless of political divisions, Walmart’s admitted overreaction now serves as an object lesson on how not to respond to a few customer complaints.